Kontserdil kõlavad klaverirepertuaari kullafondi teosed – Schumanni “Arabesk” op.18 ning “Davidsbuendlers’ Dances” op.6. Lisaks väike ootamatu seos ka eesti ja maailmamuusika vahel nimelt vene helilooja Nikolai Medtneri vanemad olid mõlemad pärit Pärnumaalt. Medtneri sulest kõlab ka osa klaverisonaadist. Esitatavat muusikat tutvustab Diana Liiv. Väikese “soojendusnumbriga” esineb noor eesti pianist, Tähe-Lee Liiv (TMKK 8. klass). Natalia esineb samal ajavahemikul soolokontserdiga Tallinnas ning viib läbi kursuseid ka Tallinna Muusikakeskkoolis. 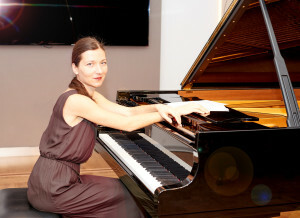 Pianist Natalia Sukharevich was born in Moscow. She started her piano education as a concert pianist at the Music College of Moscow Tchaikovsky Conservatory (class of famous teacher Y. Batuev). At the age of 14 Natalia performed Mozart’s A Major Concerto (No 23) with Symphony Orchestra of the Ministry of Defense of Russian Federation. In 1999 she was enrolled in the Moscow Tchaikovsky Conservatory (Class of professor V. Kastelsky). In 2001 she continued her studies in Moscow Tchaikovsky Conservatory in class of Peoples Artist of Russia, professor A. Nasedkin, the outstanding pianist, teacher and composer. She studied chamber music in class of professors T. Gaidamovich and A. Bonduryanskiy. In 2004 she graduated from the conservatory with Diploma of Honours under Professor A. Nasedkin. From 2004 to 2007 she continued her studies at a post-graduate course in the Moscow State Conservatory with the same teacher. From 2006 to 2008 she had a “Virtuosismo course” in Accademia internazionale di Musica in Roma (Art’s Academy in Rome) and from 2010 to 2017 high course “Corso di perfezionamento” in Accademia Musicale Santa Cecilia di Bergamo with the famous pianist and teacher K. Bogino. She has participated in masterclasses with Prof. V. Gornostaeva, L. Naumov, N. Shtarkman, E. Libermahn, O. Yablonskaya, M. Widlund, A. Hewitt, P. Jumpannen and others. She became a laureate of the National Piano Competition for Young Musicians (Moscow, 1995), of the International Piano competition “Citta di Minerbio” (Italy, 2002), of the International Piano competition “Marco Fortini Prize” (Bologna, 2005), of the International Piano competition “Premio Franco Alfano” (Genova, 2006), of the International Piano competition “Unda Maris” (Palermo, 2007), of the International Piano competition “Premio Vanna Spadafora” (Rome, 2008) etc. Ms. Sukharevich concertizes in Russia, Italy, Israel, Sweden, France, Estonia, England with solo performances and with orchestras. Concerto performances take Natalia to the distinguished halls worldwide, such as Sala dell’ Conservatorio S. Cecilia (Rome), Sala dell’ Conservatorio di musica “G.B. Martini” (Bologna), Sala Puccini Conservatorio G. Verdi and Auditorium G. Gaber Palazzo Pirelli (Milan), Konserthuset (Stockholm), The Big, The Small, and The Rachmaninov Halls of the Moscow Conservatoire, the Gnessins Academy of Music, the Glinka, Skriabin Museums (Moscow) and others. Natalia also has been a participant and guest of some important musical festivals, such as The Chamber Music Festival in Sandviken (Sweden, 2008), 4th Eilat International Chamber Music Festival (Israel, 2009), “Città di Lucca” Chamber Music Festival (Italy, 2005, 2010, 2011, 2012), LeXGiornata di Brescia (Italy, 2010, 2015), Trelleborg international Piano Festival (Sweden, 2011), “Festival Erik Satie” (France, 2016) etc. She collaborated with well-known musicians and conductors such as: P. Fedotova, E. Ottensamer, A. Mustonen, L. Shambadal, V. Luzenko, H. Zori and others. In 2009 she recorded a Master CD (Soundfactory Sonicview), produced by Arts Academy in Rome, with program that includes works by Haydn, Schumann, Chopin, Rachmaninoff. She was chosen to record a promotional CD for Accademia Perosi in Biella, Italy, in 2010. In 2015 the Musical Association “Campus delle Arti” awarded Natalia by CD recording at the Sala Trafalgar di Franco Bixio in Rome. Her diverse repertoire embraces a wide range of styles and trends, from baroque to contemporary music. She has numerous different solo programs, including four ballades by Chopin, many concertos for the piano and orchestra and lots of chamber music as well. She was awarded a Scholarship of the Elina Bystrizkaya Foundation in Moscow and a Scholarship of the Art’s Academy in Rome. She taught as an assistant of Professor Aleksey Nasedkin at the Moscow State College of Musical Performance named after Chopin.